Beginning a Collection Jane and I were married in 1963 just two weeks after we graduated from college. That fall, I entered medical school. When I graduated in 1967 we had three children. It was in 1967 while driving around New Orleans we came upon a quaint shop on Magazine Street named “Pontils and Pegs”. Curious, because of old bottles in the window, we went in. We were amused by the names embossed on some of the bottles. “Dr. Kilmer’s Swamp Root Kidney Liver & Bladder Cure” and “Glover’s Mange Cure” were among our favorites. The proprietor said that old bottles like these were dug from privies and wells and even found under houses. We bought several for a couple of dollars and the next weekend sent our two oldest children crawling under houses in the neighborhood and under the house of a colleague’s mother which dated back to the 1850’s. While there, the colleague’s mother said she had some old bottles that had been in her family for many years, coming down from an ancestor who was a pharmacist at the time of the civil war. She presented us with two handle jugs, one globular and the other a flattened chestnut form. Both brilliant amber with millions of tiny seed bubbles. Both bottles were pontiled. The jug had an iron pontil, the chestnut an open pontil. She asked if we wanted them. We immediately said yes. They were absolutely pristine mint and the first mint bottles that we had ever seen. This was all in 1967. The other was a square cobalt blue bottle, London Royal Imperial Gin. We fell in love with these bottles. Mr. Cope had $100.00 on the pickle and a $150.00 on the gin. The total was $250.00, exactly what I had made working the emergency room the weekend before. I looked at Jane and she looked at me and said, “endorse the check” and that was that. We were on our way…. On a drive across lake Pontchartrain, doing some “antiquing”, we stopped at a shop in Ponchatoula and an old odd-looking bottle caught Jane’s eye. It had a crude arch configuration on each of its four panel and the dealers told us this was a “cathedral pickle”. Jane fell in love with this bottle and we purchased it for $25.00. This was the most we had ever spent on a bottle. Our collection was growing, and we now had multiple sizes of Bromoseltzers and Bromo Caffeine’s, three of the four Carter’s Inks, a “Piso’s Cure” and three St. Louis medicine bottles, amber, blue, and purple. I completed my radiology training in 1971 and entered the Navy Active Reserve in Pensacola, Florida between ’71 and ’73. I made almost a dozen of trips to the New England area to attend live auctions, flying “military standby” which was really cheap. During those years we collected blue creamers, some Harrison’s inks, and a few relatively inexpensive blue flasks. With my Navy salary and extensive moon lighting our expendable income had increased and we could afford some nicer bottles. In 1968, I was an intern. One weekend I had worked in a hospital emergency room and received a paycheck of $250.00. This was great because at that time an intern’s salary was $120 a month. Needless to say, money was tight. The weekend after I had worked in the emergency room, we were visiting my parents in Franklin, Louisiana and on the way back to New Orleans passed through the small town of Jeanerette, Louisiana. On the side of the road was a sign “Bottle Show and Sale”. We had to stop in. There are a half dozen dealers including one “big time dealer from Texas” by the name of Jim Cope. His table was filled with mint bottles. We were in awe as the majority of our collection at this time were dug bottles. Two caught our eye. One was a large magnificent “apple green” Cathedral Pickle with lattice windows embossed on three sides. Specializing in Blue We soon realized that we liked all of the genres of bottles but that one could not collect them all. We decided we would specialize and try to get the best we could across all the genres of collecting but limiting it to the color blue. In 1972, at a Skinner’s auction in Bolton, Massachusetts, I saw a Blue Fish Bitters. I held my hand up to bid but the bids went over the estimate very quickly and well out of my price range. The bottle was sold to Elvin Moody and I believe it may have been one of the first American glass bottles to sell for more than $1000.00. In 1973, we took a trip to Ohio to Garth’s Auction Barn to see one of the Wettlaufer auctions and there saw some amazing bottles and were able to purchase a GII-24 Louisville double eagle in a brilliant sapphire blue. At the time, it was the prize of our collection. Then at a Louisville bottle show, we got a blue Corn For The World from Dave Goad, “the traveling bottle man”. successful auction. However, as the day went on, we acquired a total of six blue flasks from Judge Blaske’s collection including a blue G-IV “Masonic”. There is a nice piece about that flask in the Blaske Auction Catalog , Item #525, “they got it from a Canadian dealer, site unseen, for approval. The Judge opened the package late one night, on returning from a trip, “weary”. When he saw it, the Judge was suddenly “wide awake” and they stayed up for several more hours, “washing and admiring the bottle”. Attending Bottle Shows During the 70’s, Jane and I attended many shows in the south, southeast, and southwest. Jane loved to make exhibits and had a wonderful artistic touch. We put up a display at almost all the shows we attended and did recoup a number of Best in Show blue ribbons. In 1976, we attended the Great Expo in St. Louis and put up a display of 115 blue bottles. That was a truly thrilling event. The Polaroid Piece In the late 70’s, a dealer sent me a Polaroid photograph of a blue wine bottle embossed with leaves and a cluster of grapes on a stump. This bottle was blue and un-embossed. However, it is exactly like the Imperial / Levee / J.Noyes / Hollywood / Miss figural bottle. The amber is embossed and uncommon but blue examples are unembossed and extremely rare. The dealer who sent the picture said that the collector who owned the bottle was not interested in selling. He would not tell me who the collector was but had sent the picture just as a tease. We put the picture on our refrigerator. In the early 1990’s, I received a phone call and the dealer said the collector wanted to sell. I jumped at the chance and we obtained the bottle and I was able to take down the polaroid which had been on our refrigerator for some 25 years. An Auction Fifty Years in the Making We continued collecting through the 80’s and 90’s although live auctions became more and more uncommon and of course now, all auctions are online. We obtained a few blue bottles every year. 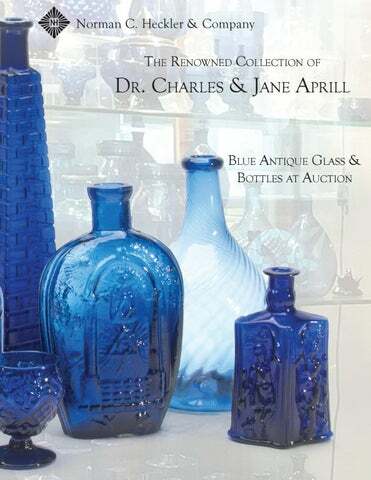 By 2016 our collection had reached 300 blue bottles across all collecting genres. We also had some non-blue bottles including 50 creamers and 50 snuff bottles, as well as two dozen cathedral pickles and pepper sauces. We have been lucky at many auctions and also lucky in private sales from some wonderful dealers. Jane and I decided we would stop active collecting when we reached the age of 75. We both agreed that it would be wonderful to auction our collection so that we could enjoy watching the bidding on our various prized pieces. Unfortunately, Jane passed before the auction, in March of 2017. I miss her dearly but think that she is probably looking down from above and will enjoy watching the dispersal of this 50 year long labor of love. “Harrison’s Columbian Ink” Gallon Master Ink Bottle This exceptional master ink contained ink manufactured by Apollos W. Harrison at 8 1/2 South 7th Street, Philadelphia. Advertisements and directories refer to Harrison selling ink, maps, books, perfumes, flavored extracts, hair dye and other assorted products. The Blue Fish The blue fish has long been a topic of interest and desire among bottle collectors, particularly bitters collectors. This bottle would provide a powerful presence in any collection. Big, bold, beautiful and “oh” so rare! Firecracker Flask The bottle is referred to as the “firecracker flask” because of the names of John Adams and Thomas Jefferson embossed on the medial ridge of the flask, along with the date of 1776. Adams and Jefferson both died on the 4th of July 1826. This flask is in commemoration of that event. Collecting Cannons In 1974, I was in practice in Houston, Texas. We had the opportunity to buy three figural cannons from Rick Meyer of Atlanta, a Gayen / Altona, a large olive green R. G. & A Wright and a miniature blue R. G. & A Wright. I became enamored of the figural cannons and ultimately had a collection of 26 different cannons including two large R.G. & A Wright cannons, olive green and a “puce” example, as well as an amber General Scott’s New York Artillery Bitters and an olive green Barto’s Bitters. Only two miniature R.G. & A. Wright cannons were known to exist, one cobalt blue and another a deep amethyst. Originally they belonged to a great collector of early American glass in the first half of the 20th century, Gordon Bass. The Bass collection was auctioned at Skinner’s in Bolton, Massachusetts in the early 60’s. Tom McCandless of New Jersey purchased the amethyst example. Rick Meyer from Atlanta was reportedly rushing to the auction house and was speeding, caught by the police, and arrested. He was reportedly given one phone call from jail, and he made that call to the auction house to bid on the blue cannon, which he got for $500.00. This is the one I bought from Rick in 1974. I desperately wanted the amethyst cannon because I loved it and just thought the two of them belonged together. Over the next thirty years or so, I saw Mr. McCandless at bottle shows and bottle auctions and visited with him at his home. Incidentally, he had a wonderful collection of antique “mousetraps”. Each time our paths crossed I offered to buy the amethyst cannon, at one time saying, “What will it take to get it”. His response was always gentlemanly, “Charles, it’s really not for sale”. Jane and I visited Tom and Marian on several occasions enjoying their mousetrap collection and all of their wonderful bottles but particularly the amethyst cannon. On our last visit, I said to Tom, “Well, I know it is not for sale, but Tom you’re older than me”, and with that I waited. Tom passed in 2010, God Bless his soul, and his collection came to auction in 2011. I had the opportunity and did win the amethyst cannon and now these two miniatures sit in a window beside my chair in our study and I look at them every day. Charles Aprill, M.D. The items pictured above remain with Dr.Charles Aprill and family as treasured reminders of his exceptional collection. Antique American Medicine Bottles, Matt Knapp, 2012. Antique Glass and Bottles, Willy Van den Bossche, 2001. American Glass, Volumes I and II, Schwartz and DiBartolomeo, 1972. Glass In Early America, Arlene Palmer, 1993. Antique Seal Bottles 1640-1900, David Burton, 2015. Western Whiskey Bottles, #4, R. E. Barnett, 1997. Bennington Pottery and Porcelain, Richard C. Barret, 1958. A.M. Bininger Bottles, Jim Bender, 2017. The Glass Industry in Sandwich, Raymond Barlow and Joan Kaiser, 1989. Ink Bottles and Inkwells, William Covill, 1971. American Sarsaparilla Bottles, John DeGrafft, 1980. American Stoneware Bottles: A History and Study, David Graci, 1995. (Flasks) American Bottles & Flasks (PartVIII), Helen McKearin and Kenneth Wilson, 1978. (Blown Three Mold) American Glass (Chapter VI), George S. and Helen McKearin, 1941. Glasshouse Whimsies, Joyce Blake and Dale Murschell, 1989. American Bottles in the Charles B. Gardner Collection, Norman C. Heckler, 1975. The Glass Industry in Boston, Joan Kaiser, 2009. TeaKettle Ink Price and Reference Guide, Joe L. Mathews Jr., 2016. Whiskey Bottles Of The Old West, John L. Thomas, 2002. Poison Bottle Workbook, Rudy Kuhn, 1988. New England Glass & Glassmaking, Kenneth M. Wilson, 1972. The Red Book of Fruit Jars, No. 10, Douglas M. Leybourne, Jr., 2006. American Glass Cup Plates, Ruth Webb Lee and James H. Rose, 1948. A Rare Collection of Keene & Stoddard Glass, Lyman and Sally Lane and Joan Pappas, 1970. American Glass, George S. and Helen McKearin, 1941. American Bottles & Flasks and Their Ancestry, George McKearin and Kenneth Wilson, 1978. Great American Pontiled Medicines, Frederick Nielson, 1978. Barber Bottles with Price, Robert Namiat, 1977. The Blaske Collection of American Flasks, Norman C. Heckler, 1983. The Blaske Collection: Part II, Norman C. Heckler, 1983. Pressed Glass Salt Dishes of the Lacy Period 1825-1850, L. W. and D. B. Neal, 1962. The Glass Gaffers of New Jersey, Adeline Pepper, 1971. Pittsburgh Glass, Lowell Innes, 1976. Pontil Medicine Encyclopedia (Second Edition), John Odell, 2007. Bitters Bottles, Carlyn Ring and W. C. Ham, 1998. Understanding Antique Wine Bottles, Roger Dumbrell, 1983. Early American Bottles and Flasks, Stephen Van Rensselaer, 1927. Collectors Guide to Saratoga Type Mineral Water Bottles, Donald Tucker, 2005. Two Hundred Years Of American Blown Glass, Helen and George McKearin, 1949. Collectible Character Bottles, Arthur & Jewel Umberger, 1969. Early CT Soda Proprietors & Their Bottles, William G. Beckett, 2018. Ketchup, Pickles, Sauces, Betty Zumwalt, 1980. An example - You bid $900.00 on a lot which is the highest bid received to date. The second highest bid is $550.00. The current high bidding level would be yours at $600.00. Any other bids submitted by others below $900.00 will be advanced automatically in the auction system. Incoming bids will be accepted on the closing day until 10 PM Eastern (7 PM Pacific). Only online bids will be accepted after 10 PM Eastern (7 PM Pacific) for auction lots that are still open. TIMED CLOSING: This auction will close at 10:00 PM Eastern on the last day of the sale; however, if there are successful bids on individual items within the last 10 minutes (9:50 - 10:00 PM), then the auction will continue for those individual items. For each item that has received bids in the last 10 minutes, the closing of the item is extended until there are no further bids for a continuous 10 minute period. Lots that have no bidding activity in the last 10 minutes will close at 10:00 PM Eastern. 5. Call Back Process: Following the Timed Closing, only the top three bidders who have bid $2,000 or greater are entitled to Call Backs. Note it is possible that there can be two bidders at the $2,000 level, and both will be entitled to Call Backs. You can request to be removed from Call Backs by “checking” the appropriate box either while bidding online or while placing your absentee bids. Hecklers will call eligible bidders to continue bidding on the Call Back lot until only one bidder remains. Unless you have requested to be removed from the Call Back process, the auctioneers will need to contact you on the days following the auction closing between the hours of 8 AM and 9 PM Eastern. Bidders must provide appropriate telephone numbers where they can be contacted. If you are traveling during the Call Back period, please contact Hecklers twice daily by telephone or email to update your bids. Bidders involved in Call Backs may call Hecklers to check the status of a Call Back lot. If Hecklers is unable to contact a Call Back bidder for two consecutive days, the bidder forfeits his rights to a Call Back. Heckler reserves the right to discontinue “Call Backs” (2) two days after the closing date of the sale. No “Call Backs” will be executed for bids under $2,000.00. 6. Successful Bidders: Successful bidders will be notified both by email and postal mail. A 17% buyer’s premium will be added to the closing price to be paid by the buyer as part of the purchase price. Payment is due immediately upon receipt of notification of purchase. No exceptions. Accepted forms of payment are bank check, personal check, cash, or money order. Bank check or money order will facilitate immediate processing. If you pay with uncertified funds, Heckler may not ship items until ten business days have passed from the deposit date. If you see that your check has cleared, you may send front and back copies of the canceled check, and Hecklers will remove the shipping hold. If you are a Connecticut resident, a 6.35% sales tax will be added to your bill, unless you provide Norman C. Heckler & Company with a tax exemption permit. Sales tax is also applicable to out of state buyers who pick up their purchases at our location unless you have a tax exempt number from Connecticut or your state on file with us. All purchases and transactions must be in U.S. Dollars. 7. Shipping: Purchases will be shipped only after full payment has been received. All items will be shipped via United States Postal Service. Shipping, handling and insurance are extra. Our shipping charges for most glass items and accessories (excluding foreign shipments) are $20.00 for the first item, $9.00 for each additional item together with insurance costs ($0.60 per $100.00). Additional charges may apply for large or unusually shaped items, and/or certain postal zones which USPS attaches a surcharge. 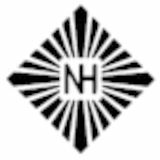 Some items may require transport through a fine arts carrier which can be arranged by the buyer or with Norman C. Heckler & Company. We encourage you to plan for a pickup of your items at our offices. 8. Refunds: Refunds will be given at the discretion of the Auctioneers. Items purchased must be examined and a request for refund made immediately upon receipt of the items. The Auctioneers will be the sole judge in consideration of refunds. It is the Auctioneers sincere intention to consider any reasonable request for a refund pertaining to a major oversight in the description of an object (ie: large epoxy repairs, large chips, extensive cracks, etc.) and not nuances of color, minute flaws, or normal antique “fair wear and tear”. 9. Administration: If at any time during the auction period an act or circumstance takes place which impedes or affects the normal auction process, the auction can be postponed or terminated at the auctioneer’s discretion. 10. Terms: Bidding on any item indicates your acceptance of these terms.